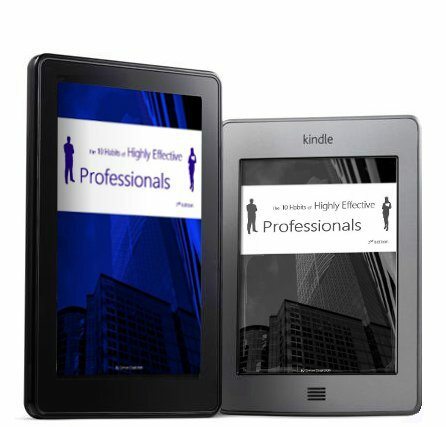 This week, I published my new book The Ten Habits of Highly Effective Professionals (3rd Edition). Available on Amazon Kindle now. I would love you to read it. This book is aimed at ambitious people who want to grow their career and develop the skills to succeed. It’s based on years of research and shares ten ‘habits’ exhibited by the most successful professionals. I make no apologies that the title of this book is inspired by Stephen Covey’s “7 Habits of Highly Effective People”. Covey’s book is one of the most quoted and referenced management book around, and although in 2015 the book is over twenty-five years old, it still remains fresh and highly valuable. This is because it shares with us the essential behaviors of success, in whatever field of work you’ve chosen. So in this book I have adapted the concept and applied it to the pursuit of success by professionals. With the help, insight and brainpower of many colleagues and associates from across the globe, I researched the behavioral traits of very successful and highly effective professionals. The result: We have identified the Top Ten most effective behaviors consistently and continuously exhibited by the most successful and influential professionals we have had the luck to work with. So let me show you how the very best do it. I’ll show you how to join the Professional Elite in the most powerful way of all – forming habits that only the Highly Effective Professionals do. It’s a short book and takes less than 30mins to read, which is why I have priced it right – great career and personal development advice for less than a beverage at Starbucks! Check the Amazon store now. Previous Article What is Your Greatest Personal Achievement at Work? Next Article I've just launched new forums - join my community!